In the present work, it is proposed, for the first time, an on-line automatic renewable molecularly imprinted solid-phase extraction (MISPE) protocol for sample preparation prior to liquid chromatographic analysis. The automatic microscale procedure was based on the bead injection (BI) concept under the lab-on-valve (LOV) format, using a multisyringe burette as propulsion unit for handling solutions and suspensions. A high precision on handling the suspensions containing irregularly shaped molecularly imprinted polymer (MIP) particles was attained, enabling the use of commercial MIP as renewable sorbent. The features of the proposed BI-LOV manifold also allowed a strict control of the different steps within the extraction protocol, which are essential for promoting selective interactions in the cavities of the MIP. By using this on-line method, it was possible to extract and quantify riboflavin from different foodstuff samples in the range between 0.450 and 5.00 mg L−1 after processing 1,000 µL of sample (infant milk, pig liver extract, and energy drink) without any prior treatment. For milk samples, LOD and LOQ values were 0.05 and 0.17 mg L−1, respectively. The method was successfully applied to the analysis of two certified reference materials (NIST 1846 and BCR 487) with high precision (RSD < 5.5%). 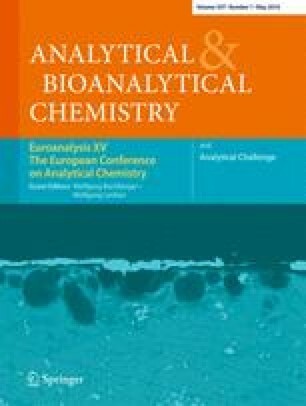 Considering the downscale and simplification of the sample preparation protocol and the simultaneous performance of extraction and chromatographic assays, a cost-effective and enhanced throughput (six determinations per hour) methodology for determination of riboflavin in foodstuff samples is deployed here. The online version of this article (doi: 10.1007/s00216-010-3522-1) contains supplementary material, which is available to authorized users. This work was financially supported by FCT through project PTDC/AAC-AMB/104882/2008, by Spanish Ministry of Education and Science through project CTQ2007-64331, and by Integrated Action no E-48/09. Hugo M. Oliveira thanks Fundação para a Ciência e Tecnologia (FCT) and FSE (III Quadro Comunitário) for the PhD grant SFRH/BD/22494/2005. The authors thank Dr Ferran Hierro from the Microscopy Laboratory at the University of the Balearic Islands for providing the electron microscopy picture of the MIP material and Mr. Marcelo Vaz Osório for technical assistance.